There are many Festivals in Nigeria, some of which date to the period before the arrival of the major religions in this ethnically and culturally diverse society. The main Muslim and Christian festivals are often celebrated in ways that are unique to Nigeria or unique to the people of a locate a Gaya  The Nigerian Tourism Development Corporation has been working with the states to upgrade the traditional festivals, which may become important sources of tourism revenue. Christians account for about 40% of the Nigerian population, living throughout the country but predominantly in the south. The main Christian festivals are Christmas and Easter. The way in which these holidays are celebrated often incorporates traditions from earlier religions. Christmas is held on 25 December each year to celebrate the birth of Jesus Christ. It is a public holiday in Nigeria. In Igboland, in addition to a church service and distribution of gifts the festivities may include Mmo (masquerade) dancing, where men in their twenties or thirties dress in colorful costumes and wear masks. These masquerades, which pre-date the introduction of Christianity, honor the ancestral spirits. In some areas, palm branches are hung inside and outside the houses, signs of peace and symbols of Christmas. Easter is held to commemorate the crucification of Jesus Christ on Good Friday and to celebrate his resurrection three days later on Easter Sunday. It is a public holiday in Nigeria. Easter usually occurs in April. Easter Sunday is a joyful occasion, celebrated with feasting, dancing, drumming, and sometimes with public masquerades and dancers. Christmas and Easter may be times of heightened tension between Christians and Muslims in some areas. On Christmas Eve in 2010 at least 38 people were killed, including shoppers and church attendees. Members of the extreme Islamist sect Boko Haram were blamed for several incidents. Some reports placed the death toll as high as 80. In 2011, Easter occurred just after elections in which Goodluck Jonathan, a southerner and Christian, had been elected President. Churches were burned in some parts of northern Nigeria, and some Christians were killed in post-election violence. About half of the population of Nigeria adhere to the Muslim religion, with Muslims living throughout the country but particularly in the north.50% are Muslims 40% are Christians and 10% percent are other practiced religions  There are two main Muslim festivals, Eid Al Fitri and Eid Al Kabir, all national public holidays. The different ethnic groups in different locations have the same way for celebrating these festivals. The three-day festival of Eid Al Fitri celebrates the end of the holy month of Ramadan, a period of fasting from dawn to dusk each day. The festival is a time to give charity to the poor, and to celebrate the completion of Ramadan with family and friends. Eid al Kabir (known as Eid al-Adha elsewhere), or "Festival of Sacrifice", is an important religious holiday celebrated by Muslims worldwide to commemorate the willingness of Abraham (ʾIbrāhīm) to sacrifice his son Ishmael (Ismā'īl) as an act of obedience to God, before God intervened to provide him with a ram to sacrifice instead. A ram, goat, sheep, cow or camel is sacrificed, with the family eating part of the animal and donating the rest to the poor. The festival is celebrated on the tenth day of Dhu al-Hijjah, the last month in the Islamic calendar. Durbar festivals are celebrated at the culmination of Eid al-Fitr and Eid al-Adha. Durbars have been held for hundreds of years in the northern states, notably the Daura Emirate, and gave an opportunity for conscripts to the army to display their skills as horsemen. In modern times, durbars are held in honor of visiting heads of state. They include a parade, shows and competitions. The horsemen are dressed in vividly colored costumes, with period weapons, and are accompanied by a drum corps and musicians. Modern Durbar festivals include prayers at the start of the day, followed by parades in town squares or in front of the local Emir’s palace. Horsemanship is still the main focus. Each group must gallop at full tilt past the Emir, then halt and salute him with raised swords. Durbar festivals are being developed as important tourist attractions. Ikeji Ikeji cultural festival of Arondizuogu in Imo State is a popular festival that brings the Igbo speaking community around the world together. Its origin dates back to over five centuries and it is acclaimed as the biggest pan-Igbo cultural community festival with strong heritage, international recognition and is witnessed by thousands of people on a yearly basis. It is arguably the biggest cultural festival in Igboland. In contemporary times, each passing year has witnessed an increase in grandeur, display, dance, sophistication and an all inclusive participation of all Arondizuogu people and friends. The festival is marked with colourful display of different masquerades such as Ogionu, Mgbadike, Nwaaburuja and Ozoebune; prestigiously parading across the market square to the admiration of the public. The essence of the festival, which ranks among the best surviving traditional ceremonies of the Arondizuogu people, is to celebrate the harvest of the first yams. It serves to unify and foster ties among Aro people who are spread across the entire Igbo speaking states and part of Cross River state. It appeals to the entire Igbo speaking peoples both at home and in the Diaspora. Ikeji is a four-day festival of propitiation, thanksgiving and feasting which is held annually in March or April. Reckoned with the Igbo calendar, these four days correspond to one Igbo week of four market days (Eke, Oye/Orie, Afo and Nkwo). Each of these days has a special significance and represents one of the several dimensions of Ikeji – a festival renowned for sumptuous feasting, fascinating masquerades, pulsating rhythms, and colourful performances. Traditional musical instruments used to accompany the masquerades are ekwe (wooden slit drum) of various sizes, ogene (metal gong), bells, maracas and oja (wooden flutes). The flutist is a very important element in the ikeji festival. He deftly communicates with the masquerades - weaving soulful melodies and blending esoteric messages into the intoxicating rhythm of the drums. Another interesting aspect of ikeji is the raconteur known as ima mbem - an imaginative tale delivered with a musical cadence that only the initiated can sometimes understand or comprehend. The importance of the flutist during Ikeji festival is very vital, for he communicates things hidden from the ordinary eyes to the masquerades, combined with soulful melodies, steps and gestures, “blending esoteric messages into the intoxicating rhythm of the drums” to the admiration of the crowd. During Ikeji festival,ON THE LAST DAY, a ram is usually tied to a pole at a popular market square with a single thread.Somebody with the strongest protection from any juju of whatever type is expected to leisurely walk to the ram amids heavy attempt with juju from other people to knock him down, maim him or kill him.Only the brave can participate in, while the NOT SO BRAVE will either abstain from or remain with the crowd as spectators. Only the brave can stand forward from the crowd, one after another and approach the tree with a view to untying the ram. However, each contender will be attacked by forces which are beyond the scope of this article to explain, with a view to stopping him reaching the ram. If overwhelmed, he will beat a retreat back to his starting point. Until eventually, the bravest among the masquerades participating in the competition for that year’s festival, after overcoming all odds, will reach the ram and untie it and take it, to a thunderous applause by the spectators. This will be followed by visits to his house by fellow kinsmen with food and wine for elevating the status of his village. Each year this is used to commemorate the person in Arondizuogu and neighbouring towns with the strongest juju or voodoo power. The Calabar Carnival has been held in Calabar since 2006, including band competitions, a parade, food and dancing. It has been called Nigeria's biggest street party. The carnival may have as many as 50,000 costumed participants and 2 million spectators, and is broadcast on television across the country. It is the culmination of the month-long Calabar festival. The Calabar Carnival holds at the end of the year in Nigeria, and in keeping with tradition, carnival teams march across the streets where they engage in colorful displays and competitions from which winners are selected and awarded. Participating teams usually rehearse for months in advance before the carnival date itself. Young Stunna performing at Carniriv Opening Ceremony. The Carniriv (English: Car-nee-rev) is an annual festival, held in Port Harcourt, Nigeria. The Carnival starts few weeks before Christmas, and lasts for seven days. During this time several ceremonial events are held, most of which hold some cultural and or sacred significance. The Port Harcourt Carnival bears a certain uniqueness as it combines two carnivals - a purely cultural carnival and a contemporary Caribbean style carnival- in one. This gives it an edge over all other regional and continental carnivals, and presents with the principal advantage which must be consummately exploited. The Government of Rivers State recognizes Carniriv as its biggest tourism export. With economic interests increasingly identifying tourism as a viable alternative to the fossil fuel economy–especially in these parts–the state government has exhibited its commitment to developing this carnival into a regionally unrivalled and globally reckoned tourist attraction. Thus, it has always made available the necessary monetary backing needed for the event to hold every year, and has also worked hard through the Ministry of Culture and Tourism to see that it is held. The Igogo Festival is an annual festival held in Ondo State, Nigeria. It is a festival that usually lasts for seventeen days in which the Olowo of Owo and high chiefs of Owo Kingdom are dressed like women to celebrate and pay homage to Queen Oronsen a mythical wife of Olowo Rerengejen in appreciation for her protection. Afiaolu (New yam festival) is a traditional festivals held annually in Nnewi around August. The Afiaolu festival commences on “Eke” day with what is traditionally described as “IWAJI” (scaling of yam) and Ikpa Nku (the wood gathering), this heralds the availability of new yam as well as thanksgiving to God. The festival includes a variety of entertainments including performance of ceremonial rites by the Igwe (king), cultural dance by girls and masquerade dance. The Ofala Festival also called Ofala Nnewi, is an annual ceremony practiced by the indegenes of Onitsha in Anambra State, South-Western Nigeria. The term ofala (English: authority of the land) is derived from two Igbo words - ofo (English: authority) and ala (English: land). The festival which is described as the most important surviving traditional ceremony of Onitsha indigenes is celebrated within two days mostly in December and January in honour of the Obi (English: king). The Osun Festival is held at the end of the rainy season, usually in August, at the Oshogbo Sacred Forest. The week-long festival is held in honor of the river goddess Oshun, an important Yoruba deity, and is attended by thousands of people. It includes ceremonies where priests seek protection for their local communities through gifts and sacrifices to the goddess. Sango Festival, also known as World Sango Festival is usually held in August at the palace of the Alaafin of Oyo. The festival which is observed in over forty countries in the world is held in honor of Sango, the thunder and fire deity. The Sharo or Shadi flogging competition is a traditional rite of passage for Jafun Fulani men. The youths, escorted by girls, are led into the ring of spectators bare chested and armed with whips. As the noise of singing, drumming and cheering rises to a crescendo, each young man must stoically endure a flogging to demonstrate his manhood. The young man only qualifies to marry if he passes the test, which is administered by another youth of about the same age and size. Most do pass, but carry scars from the ordeal for the rest of their life. The sharo is generally staged at the time of the dry-season guinea corn harvest, and again during the festival of Id-el-kabir. Usually it lasts for a week and is held in a marketplace. There are other tyes of entertainment including dances, musical performances and tricksters, but the flogging ceremony is the main event. Yam Festivals are popular holiday in Ghana and Nigeria, usually held in the beginning of August at the end of the rainy season. It is named after yams, the most common food in many African countries. 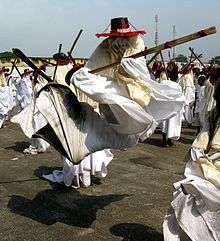 In Nigeria, dancers wear masks that reflect the seasons or other aspects of nature. People offer yams to gods and ancestors before distributing them to the villagers to give thanks to the spirits above them. Leboku is the name for the annual New Yam Festival celebrated in Ugep, Nigeria, one of the five settlements of Yakurr, to honor of the earth goddess and the ancestral spirits of the land. The Iriji-Mmanwu festival is held in Enugu state in August. At the festival, over two thousand masqueraders from across Igboland and from other states in Nigeria dance and give acrobatic displays, wearing unique and colorful costumes. In the Igbo tradition, masquerades are thought to be reincarnated dead ancestors, with supernatural powers. 1 2 3 4 "Festivals in Nigeria". Online Nigeria. Retrieved 2011-04-26. 1 2 3 4 5 Oxford Business Group. "Patchwork of Celebration". The Report: Nigeria 2010. Oxford Business Group. p. 243. ISBN 1-907065-14-8. 1 2 3 "Nige--~~~~ria Public Holidays 2011". Q++ Studio. Retrieved 2011-04-26. ↑ Ifeoma Onyefulu (2007). An African Christmas. frances lincoln ltd. p. 7. ISBN 1-84507-421-1. ↑ Arlene Erlbach; Herb Erlbach; Sharon Lane Holm (2002). Merry Christmas, Everywhere!. Lerner Publications. p. 38. ISBN 0-7613-1699-X. ↑ "Easter Sunday Dates". GM Arts. Retrieved 2011-04-27. ↑ "Holidays". Motherland Nigeria. Retrieved 2011-04-26. ↑ "Christmas Eve Attacks in Nigeria Kill at Least 38". Voice of America. 25 December 2010. Retrieved 2011-04-26. ↑ Ethan Cole (December 29, 2010). "Nigeria Christmas violence death toll rises to 80". Christian Post. Retrieved 2011-04-26. ↑ OPEYEMI AGBAJE (27 April 2011). "Innocent blood at Easter". BusinessDay. Retrieved 2011-04-27. ↑ "Mapping out the Global Muslim Population" (PDF). The Pew Forum. October 2009. Retrieved 2011-04-27. ↑ "Muslims in Nigeria Celebrate Ed-el-Fitri". Channels TV. September 10, 2010. Retrieved 2011-04-26. ↑ "Happy Eid-El-Kabir". Vanguard. 17 November 2010. Retrieved 2011-04-26. ↑ "The Durbar Festival". World Reviewer. Retrieved 2011-04-26. ↑ "Gani-Durbar Festival". Borgu Kingdom. Retrieved 2011-04-26. ↑ "Calabar Carnival". Calabar Festival. Retrieved 2011-04-26. ↑ "Things You Shouldn't Miss During Calabar Carnival". Calabar Carnival Travel Series. Retrieved 2015-11-30. ↑ Pelu Awofeso. "The Eyo Festival". Travel Intelligence. Retrieved 2011-04-26. ↑ Elizabeth, Benard; Beverly, Moon. Goddesses Who Rule. Oxford University Press. p. 272. ISBN 0195121309. Retrieved June 3, 2015. 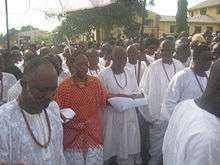 ↑ "Nnewi agog as Igwe Orizu celebrates 50 years on throne". The Sun. 17 January 2014. Retrieved 26 July 2015. 1 2 Abah Adah; Chinelo Chikelu; Paul Chiama (14 March 2014). "Nigeria's 10 Famous Festivals". Leadership Nigeria. Retrieved 26 July 2015. ↑ "2 Day World Sango Festival". Afro Tourism. Retrieved 10 August 2015. 1 2 "Festivals in Nigeria". Embassy of the Federal Republic of Nigeria in Argentina. Retrieved 2011-04-26. ↑ Marcellina Ulunma Okehie-Offoha; Matthew N. O. Sadiku (1996). Ethnic and cultural diversity in Nigeria. Africa World Press. p. 28. ISBN 0-86543-283-X. ↑ Pat Ikechukwu Ndukwe (1996). Fulani. The Rosen Publishing Group. p. 28ff. ISBN 0-8239-1982-X. ↑ "CRS Celebrates New y Festival". The Tide Online. 2008-08-15. Retrieved 2009-03-05.